The Oldest House board member Deborah Courville (top, left) shows Endless Mountains Heritage Region board members the view of the Susquehanna River from what would have been the front of the house during the canal era, while Debbie Stevens (above, left) shows (from right) Sullivan County Commissioner Wylie Norton, EMHR board member Melanie Norton, and DCNR board liaison Christine Dettore the kitchen. The Oldest House has been the recipient of funding through EMHR to repair both the roof and foundation of the historic icon in northwestern Wyoming County. 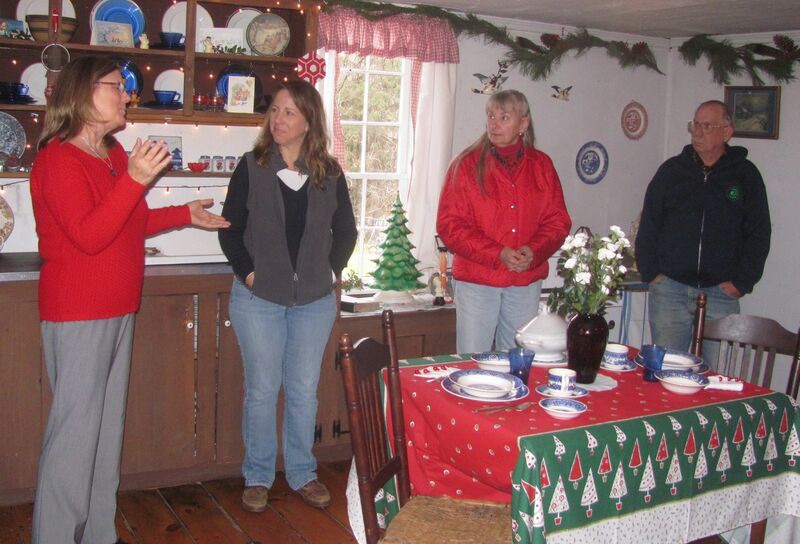 Board members of the Endless Mountains Heritage Region (EMHR) had the honor of visiting Laceyville’s Oldest House on Dec. 16 after a productive meeting held in the Braintrim Baptist Church Fellowship Hall. EMHR has provided funding to the Laceyville Historical Society for repairs to the roof of The Oldest House and will help to fund extensive foundation repairs to the centuries-old structure in the coming year. Early in 2015, EMHR members voted to hold meetings at or near “partner project” venues to gain a shared sense of the progress being made and the further potential of each site. 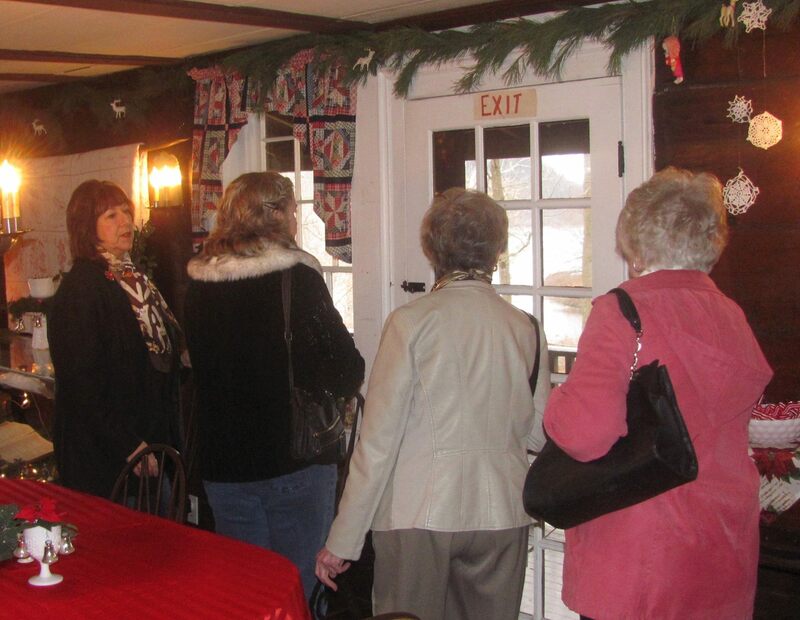 Guided tours of The Oldest House, where Christmas decorations from the 1950s were displayed simultaneously with a large variety of period clothing, were enjoyed by members representing all four counties of the Endless Mountains region. Prior to the tours, the board met for more than two hours. New board president Alice Deutsch guided the meeting, and discussions facilitated by executive director Annette Schultz included the development of a new communications plan, the importance of securing relationships with and support from county governments, formation of new subcommittees and ad hoc groups to perform a variety of tasks, and results from a series of meetings conducted by the respective board members of Bradford, Sullivan, Susquehanna, and Wyoming counties. Schultz related that discussions at the individual meetings held in Towanda, Dushore, Montrose and Tunkhannock in November exceeded her expectations. While the meetings were geared to encouraging the board members representing each county to take a more active role in spearheading projects that would meet the needs of their communities, Schultz noted that there were common goals identified at each meeting that parallel the overall mission of EMHR. Participants in the compact workshops “emphasized our interest in focusing on programs that support agriculture, including agrotourism, which relates well with our ‘Living With the Land’ theme.’” In all four counties, wayfinding and promotion, including cohesive signage, brochures, maps and apps topped the list as greatly needed to better connect people to the places and stories in the region. Participants also discussed the potential development of driving tours within each county that could easily be connected to adjacent counties. The development of more outdoor recreational areas and open space, including walking, biking and water trails was also a high priority, as is interpretation and education. A greater effort is needed, group members agreed, to impress upon school students the rich cultural and agricultural heritage of the region. Sullivan County board member and Sullivan County Historical Society president Melanie Norton encourages residents in the four-county region to contact those representing their respective counties with ideas for the development or enhancement of cultural, educational, and interpretive projects that promote and protect heritage resources within each county. For more information, readers can log on to www.endlessmountainsheritage.org or call 570-265-1528. 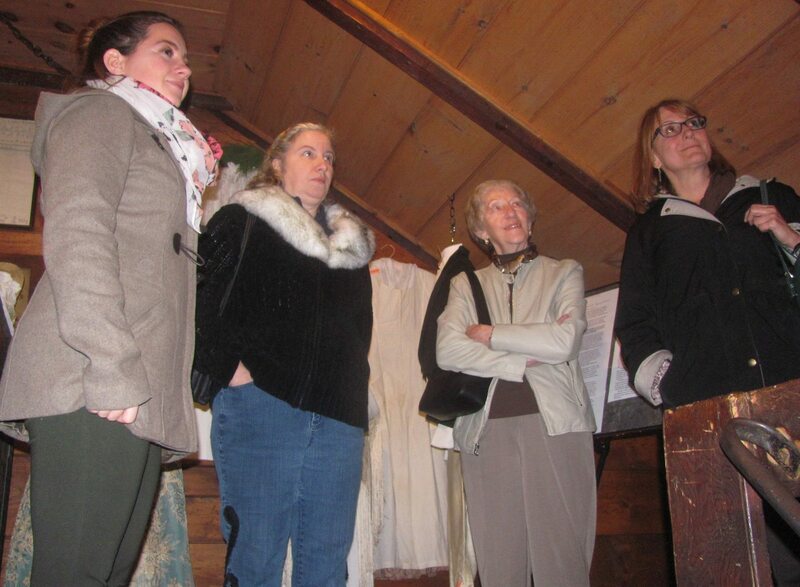 Listing to stories about The Oldest House told by board member Deborah Courville (not pictured) are (from left) EMHR program coordinator Hillary Robinson, Sullivan County board member Melanie Norton, board president Alice Deutsch of Susquehanna County, and EMHR director Annette Schultz. Excellent article. Love to see anything related to the Oldest House in Laceyville and I am very pleased to see it’s receiving some due recognition.